We're cut and wrapped here in Italy after the conclusion of a memorable final table at the PokerStars.it EPT San Remo. When this Main Event kicked off a week ago, there were 25.11 million chips spread around among the 837 starting players. Today was the decisive day, though, and now it's Andrey Pateychuck holding all those chips, €680,000, and the title of EPT champion! The day began with Kevin MacPhee on the shortest stack, and it's fair to say the majority of the poker world was rooting for him. The EPT certainly was. They've been waiting eight long seasons to try and crown a double winner, and the EPT6 Berlin champion was not to be counted out today, even despite his chip deficit. He fell first, though, sitting still for 34 hands before shoving on the 35th. Barny Boatman made a strong call with , and MacPhee's could not catch up. Seven-handed play dragged on for a while, but the procession to the payout desk soon picked up pace. Italy's Rocco Palumbo cleared out the theater when he exited in seventh, and Jan Bendik and Yorane Kerignard dropped out soon thereafter. Barny Boatmen fell next in fourth place, and the reeling start-of-day chip leader, Daniel Neilson, could not make it past third. That left the Bulgarian and the Russian heads up for the title, and the two men traded huge pots back and forth with Dimitar Danchev sneaking into a momentary lead. Over the course of the first level or so of heads-up play, the momentum seemed to be really pushing in his direction. In fact, he was one card away from the title just a few short minutes ago, but it seems the stars were aligned for Pateychuk today. By virtue of that jaw-dropping runner-runner straight, he all but ended this thing, and victory was achieved just three hands later. So then, Russia has crowned its second EPT champion, and the nation of Bulgaria is left wanting once again. Andrey Pateychuk will be the toast of the town in San Remo tonight, and he's got €680,000 reasons to celebrate. Pateychuck is just a couple years removed from a life grinding €1 Sit-n-Gos online, and now in the last six months, he's added well over $1 million to his bankroll. Pateychuk's story is a fantastic lesson in dedication and perseverance to all the micro-grinders out there who aspire to attain EPT glory. That's all we've got for tonight, except for the sending of a few well-deserved congratulations to Andrey Pateychuk, the EPT's newest champion! We'll see you in Loutraki! Dimitar Danchev raised all in from the button and Andrey Pateychuk called from the big blind. Pateychuk held the and was ahead of the at-risk Danchev's . Once again, it was another flip at this final table. The flop came down and the sevens for Pateychuk held up so far. The turn was the and now Danchev had a few more outs. He could hit a king or queen to pair, an ace to counterfeit Pateychuk's hand or a ten to smack a Broadway straight. The river landed with the and Pateychuk's sevens held strong. 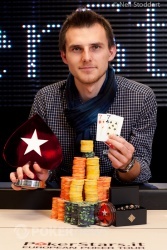 He eliminated Danchev in second place and walked away with the 2011 PokerStars.it EPT San Remo title. 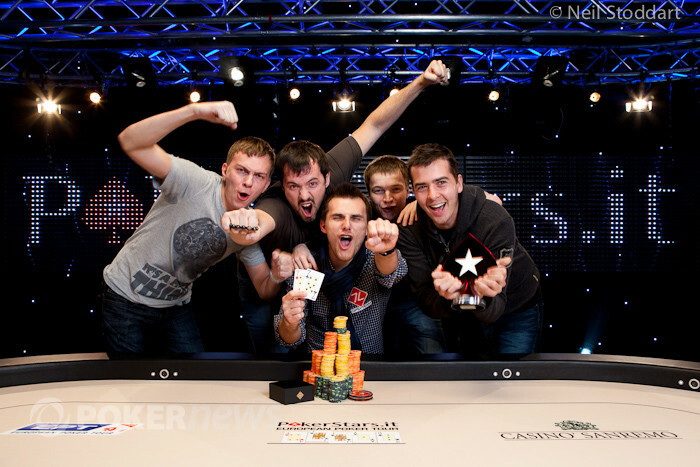 Dimitar Danchev called all in with the after Andrey Pateychuk shoved from the button with the . The board ran out and Danchev doubled back to 1.3 million in chips. On the hand following the one where he got crippled from that sick beat, Dimitar Danchev raised all in for a little around 590,000. Andrey Pateychuk thought about it and then folded, much to the surprise of the onlookers. From the button, Dimitar Danchev raised to 325,000. Andrey Pateychuk reraised to 900,000 and Danchev called. The flop came down and the top blew off. FIrst, Pateychuk bet 1.2 million. Then, Danchev raised to 2.6 million. Pateychuk came right back with an all-in shove and Danchev called. From here, what we saw was unbelievable. Pateychuk was able to turn an open-ended straight draw when the fell. Then, in an act from the poker gods, he hit the on the river to make a straight and win the hand. When the chips were counted down, Danchev was left under one million. 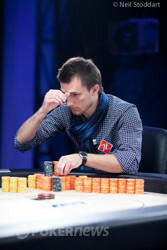 Andrey Pateychuk just picked off a bluff-raise from Dimitar Danchev on the river with second pair. Danchev only held eight high and Pateychuk pulled back to near even. From the button, Andrey Pateychuk raised to 350,000. 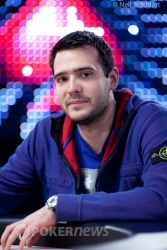 Dimitar Danchev reraised to 875,000 from the big blind and Pateychuk four-bet to 1.9 million. Danchev moved all in and Pateychuk quickly called. The board ran out and Danchev made a full house to double up. 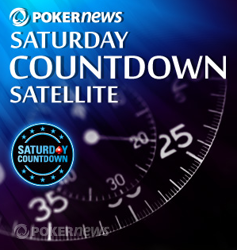 Take part in our OPEN satellite for 100 added $22 Saturday Countdown tickets on PokerStars.com. It's a great chance to get in for cheap in a tournament that you won't want to miss out on. If you don’t already have an account, download PokerStars now. Remember to use the marketing code "POKERNEWS.COM" and special bonus code "TIME" to get an additional tournament ticket worth $5.50 if you deposit $30 or more until October 28, 2011.